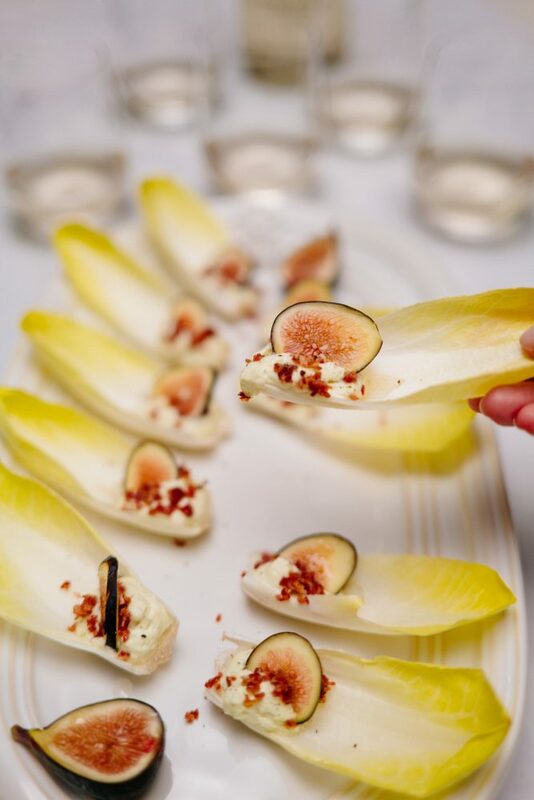 For an appetizer or snack bursting with flavor, try this modern take on a classic that pairs endive with figs and prosciutto all topped with a blue cheese foam. In this dish, figs and prosciutto are a classic twosome taken to the next level with a few tasty additions. The crispness of the endive, creamy sweetness of the fresh figs, and delicate saltiness of the prosciutto work together to create an incredible flavor profile that’s sure to be a big hit. Easy to whip up for guests, you’ll want to make this appetizer a mainstay at gatherings both big and small. Recipe originally featured on The Taste SF. To make the blue cheese foam, combine blue cheese, cream milk and a pinch of salt and pepper in a blender. Add to a whipping canister and following the package instructions, pressurize the canister and shake vigorously. Refrigerate until ready to use. Add the Prosciutto di Parma to a skillet over medium heat. Cook, stirring frequently, until it is crispy. Remove to a cutting board and chop with a chef’s knife until it is very finely crumbled. Arrange endive leaves on a serving platter and dispense about 1 tablespoon of blue cheese foam from the canister into each leaf. Sprinkle with crispy prosciutto and then freshly cracked black pepper.